Want to know what goes on before, during, and after our shows? Well here’s your inside reporter coming to you from the desk of the Night Host. Yes, I am here to give you the real scoop on how and what all goes down from Opening to Close at our Comedy Club. First show kicks off in two hours, already one of our attentive bartenders is here checking the liquor levels, beer supply, and mixers… just itching for the first order to come in, because frankly, we are a pretty fun bunch and we always like to get the party started early! Now onto our fabulous servers who are calmly preparing the seating and setting up menus for all you nice folk to order from. Honestly, everything is done in good cheer while we banter, talk life, and prepare for the comedy ahead; and when it comes to our comedy shows we do not joke around! ….OK, we do, but only in the most professional sense. By this point, it’s just a matter of time before all sorts of people begin to trickle in. Here at Stand Up NY, there is really no “backstage,” but there is a bar (and it’s not especially high, I mean it is a tall bar, but we don’t have any high standards). Pre-show guests arrive to check into their reservations and are directed to cozy up to this bar before we begin seating. There you can expect to find a range of experiences like ordering your first Marxorita (beware they are deliciously potent), watching our producer watch soap opera style wrestling matches or something else just as captivating, and potentially chat with some amazing comedians who decided to show up early just to hang out! That brings us to showtime! Here’s where it gets fun… our guests are seated, drink and food orders are taken, and we are ready to begin the main event. Our hosting comedian is supplied with the most up to date line-up for the evening shows, we make our airplane style “Cell Phones Off, Seat Belts Fastened, and No Smoking Allowed Indoors” spiel, and as our host(ess) takes the stage the real work begins! They kick off the evening for our guests, while comedians of the night stroll in and plop themselves down at the bar like any regular attendee. They come as early as two hours in advance and as punctual as literally running in the front door, walking through the bar to catch their breath, and smoothly into the showroom onto the stage… we’re not looking at you AJ Foster (who nails it every time regardless)! Most comedians will come in early and have a drink with their friends to discuss upcoming events like festivals, podcasts, and personal achievements. Once their name is called though every comedian gives their very best every night, but that’s not to imply our guests are the only ones laughing and enjoying the evening. This is when I experienced what I didn’t expect… I loved what I am going to term as “community time.” In the bar area, we are all real people; shooting the shoot, hanging out, and catching the great lines and jokes that our guests are experiencing at the same time. Anyone present gets to find out almost everything about each other. Just last week our bartender was sharing parenthood stories with Erin Maguire, joking about kids famous meals like grilled cheese night; Yamaneika and Monroe Martin were jesting with other; Jonathan Randall literally just came to have a drink and catch up with friends (he wasn’t even on the show that night! ), Sherrod Small walked down after taping his Race Wars Podcast to listen into the comedy and share a drink with his podcast guests (including a congressman). Altogether our “backstage” is just a big happy hour mingling session getting to know each other. Then comes the shows end, and this is where it gets exciting for our guests. As you stream out of the showroom and back into the bar area, I watch as comedians and attendees greet one another, exchange formalities, take pictures together, and sometimes share ideas or jokes. This all seems like celebrity treatment, but something I have noticed is that a comedian isn’t a regular type of celebrity. They touch on and sometimes attack our most personal thoughts and beliefs but in a way that brings a crowd closer together with humor stemming from mutual acceptance. Everyone walks out the same doors as a genuine human; there is no facade making out anyone to be more important, famous, or greater than any other person in the room. By the end of the night, comedians and guests alike are chilling at the bar connecting on a personal level. No where else have I experienced such a close entertainer-attendee-employee relationship and connection platform. 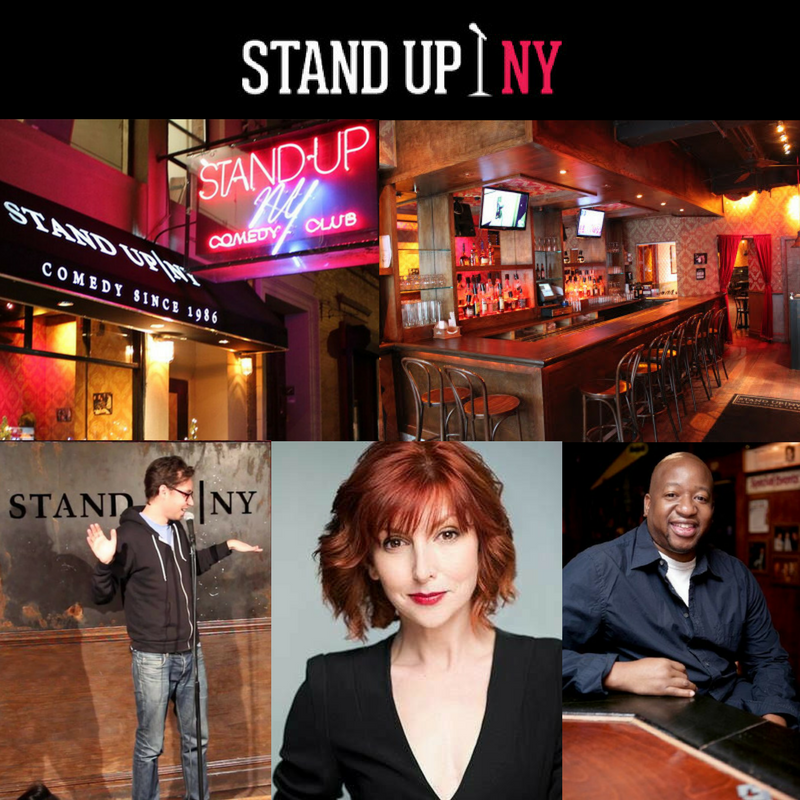 Overall, to me, it is mind blowing and thrilling to work day or night at Stand Up NY. The people you meet, the things you learn, and what everyone contributes to make this place run smoothly year round is astounding! Stop in to make your own memories and a handful of new friends any night of the week (including me)! For future shows please purchase tickets here or make a reservation today. If you want your own opportunity to make your way into the stand up comedy world, join us for our Open Mics every weekday, Monday – Friday at 5PM. Think you’ve already got a great set going? Then check out our Bring It show every Saturday at 6PM with more info on how to sign up here. By the way, we have a *New* College Summer Internship Program running June through August. Join us on Twitter or Instagram to DM us for more details!